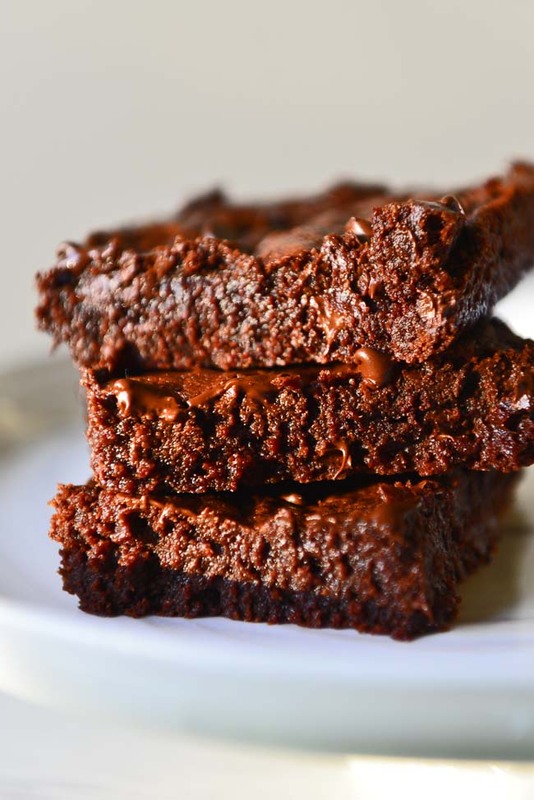 These brownies are seriously chocolaty and moist. I have used Barleans butter flavored coconut oil here – and you just can’t tell the difference . All the flavor of butter but much more moist ! 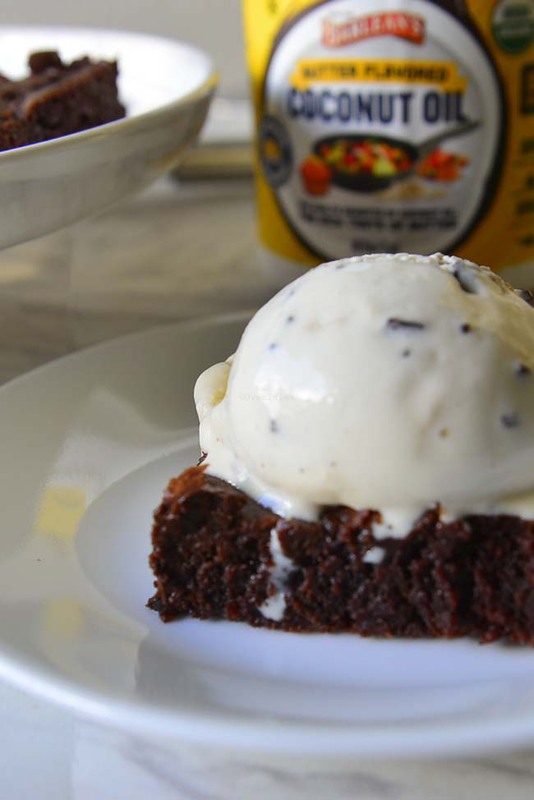 This Moist Coconut Oil Double Chocolate Brownie is a sponsored by Barleans. 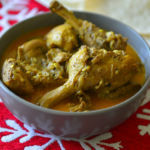 I received sample products for creating this recipe. All opinions and content are my own . 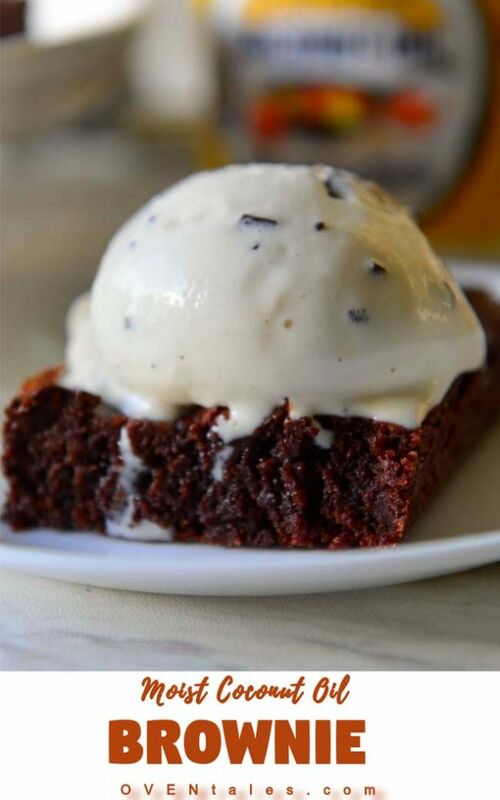 How do you like your brownies – with or without a scoop of ice cream ? I like my just like that, enjoy the chocolaty goodness without any distractions I say, but nothing wrong with a scoop of ice cream either. The thing about brownies is you can never have enough ;-). My usual brownie recipe calls for oil and not butter and is dairy free. No t intentionally though, the manufacturers didn’t always use milk fat to make chocolate chips. There are many brands out there that are dairy free. 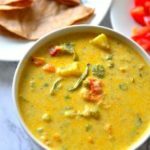 If you avoid the chips all together in this recipe it is guaranteed to be dairy free. BUT no has to know that with Barlean’s Butter flavored coconut oil ! 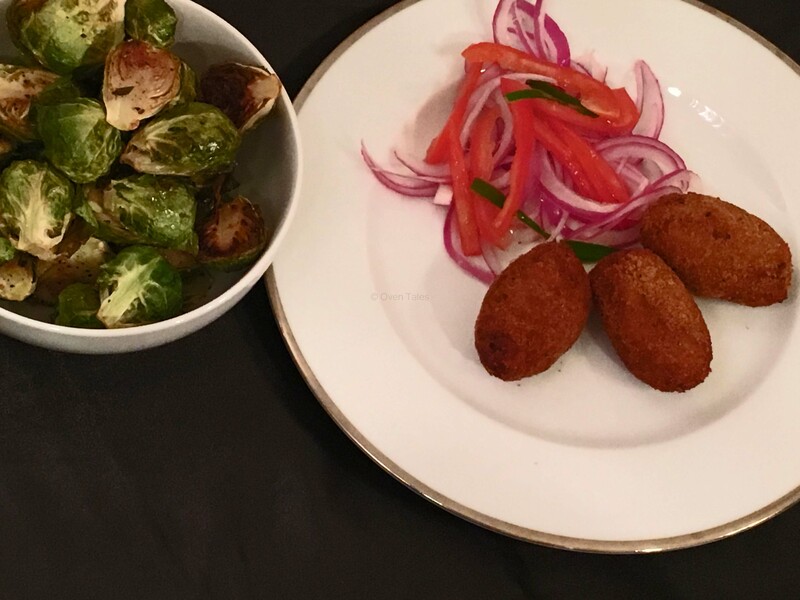 About CookoutWeek – it is still cookout week – check out the other fabulous blogger recipes at eth end of the post and yes there is still a chance tp enter the raffle and receive goodies – the raffle entry is located at …. One of the sponsors is Barleans as well ! YAY !!!! So when I received this butter flavored coconut oil from Barleans I though – perfect let me make coconut oil brownies with them. And these were a winner . No one knew what went into it and no one mentioned coconut ! It tasted like it was made with any regular double chocolate brownie, only more “fudgy” ! Yes, these brownies turned out to be much more moist than their butter counterparts. Not surprising, as that is what oil does to cakes and the like. 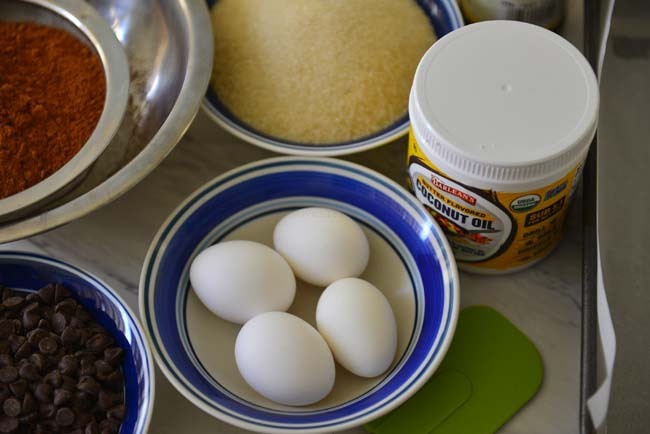 The oil makes baked goods more moist and tender. Usually the substitution alters the flavors a little , and will not be wise if you are making a classic pound cake ! 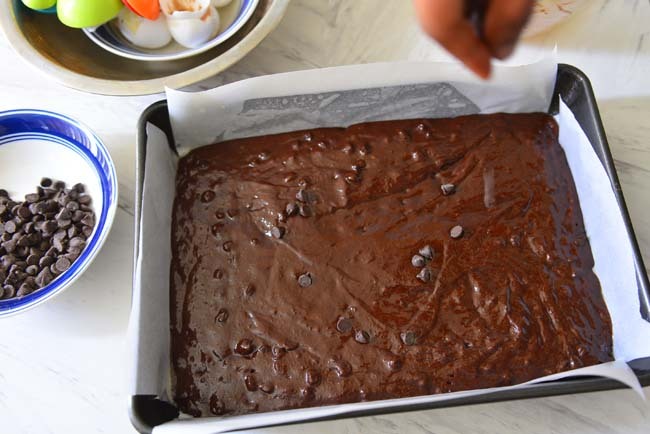 But in this case the butter flavored oil kept the flavors the same – yay to coconut oil brownie. 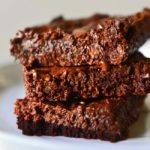 Natural Cocoa Powder is what I make these brownies with. It is rarely that I do not have a box of cocoa in the pantry. Personally I think the brownies made with cacao powder are the winners in the flavor department. Use natural unsweetened cocoa powder for the best results. This way you have much more control over what goes into the recipe. Many of the recipes call for blooming the chocolate , but that is one step I am avoiding (sort off ) here . Here is how – often times the coconut oil is solid at room temperature, so I start by warming it a little to melt it completely . To this warm/hot add the cocoa powder and mix and set aside for a few minutes. This mix is the starting point . To this add the sugar , salt vanilla and mix well. Break the eggs one by one and blend into the mix. Once everything has reached a uniform consistency gently fold in the flour. Now comes the double chocolate part. 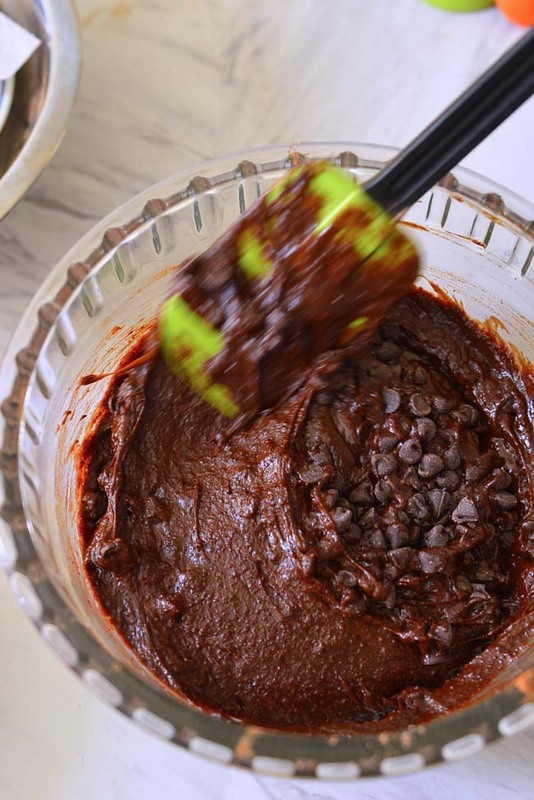 You can add the type of chocolate you like – I usually opt for t he middle ground and add semi sweet chocolate chips. These go int the recipe in 2 steps, about 2/3 of the chips get folded into the batter. The rest are sprinkled on top of the batter after it is transferred to the pan. 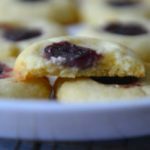 There is no leavening in this recipe , but no worries the results are fantastic without it . Now all you have to do is to bake it – about 20 to 25 minutes is all you need . Check at 20 minutes and if the brownie seems to slightly pull back from the sides it is time to take it out . it will still be a little moist inside , there is no need to use a cake tester – unless you want it dry . In that case give it an additional 5 minutes . Cool in pan. This is important, wait for these to cool before slicing int it . These are still moist and will not slice neatly if not cooled, but there is nothing stopping you from attacking it with a spoon in pan, trust me I was tempted! 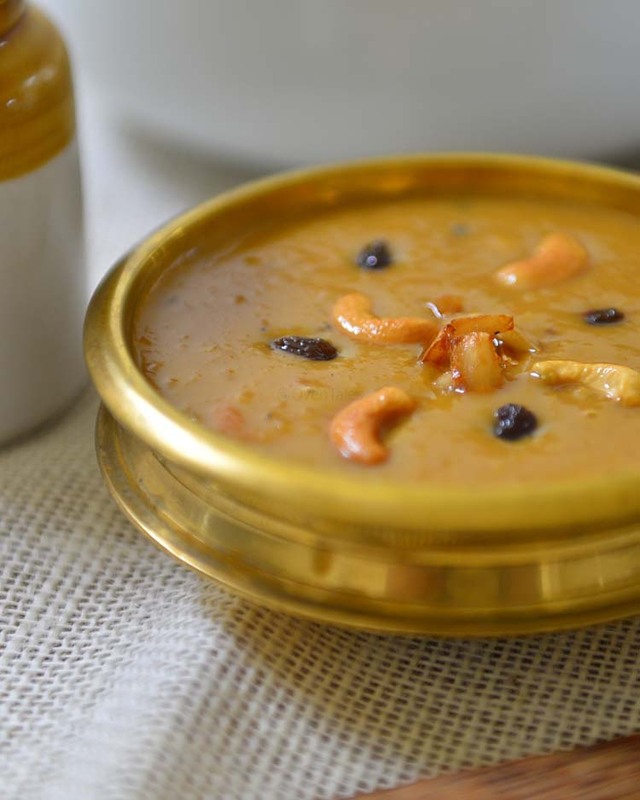 It was disappearing fast and the verdict was – definitely make more ! The brownies were absolutely delicious. There was no trace of coconut flavors , just the moist goodness ! Before I forget I made these in 9 X 13 pan , you could use a 9 X 9 pan as well. The brownies are going to be a little thicker and will take longer (about 30 to 40 minutes ) to cook . 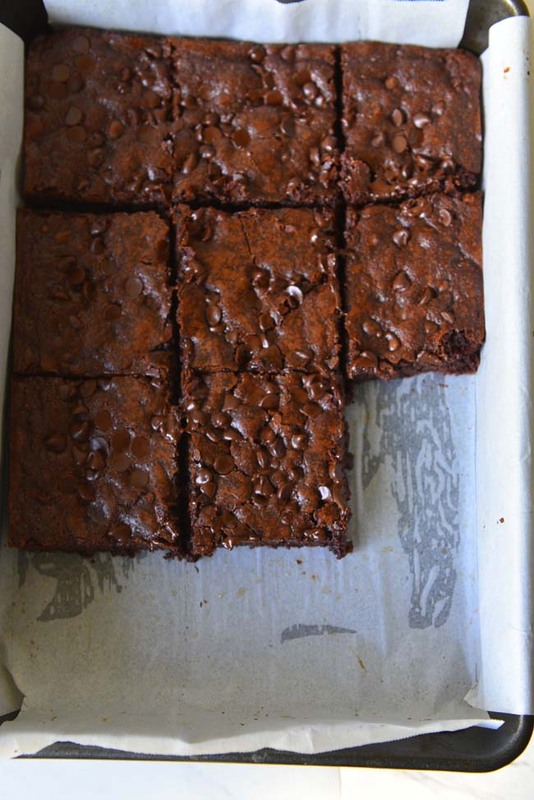 These are one of the easiest brownies to make. 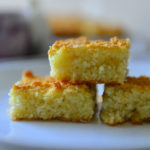 These are moist and not too sweet can be easily made dairy free. The batter comes together in one bowl and bakes up quick. If sweet milk chocolate chips are what you like then use them . Place the oven rack a little below the center and pre heat the oven to 350 F. Line the bottom and sides of an 9 X 13 -inch baking pan with parchment paper, leaving an overhang on two opposite sides, or grease the pan. The overhang helps to get the cooled brownies off the pan easily . Warm the oil in the microwave or over stovetop. Once it is quite warm (not boiling/burning) to touch , transfer to the mixing bowl and add the cocoa powder to it . Mix and let it sit for 5 minutes to come to room temperature. Add sugar salt and vanilla to this mix and stir in with a wooden spoon or spatula. Add the eggs one at a time and stir in vigorously. Use a handheld mixer set to low if needed. When the batter looks shiny and uniform add the flour in 2 batches folding in gently. The batter will thicken more and slightly pull back from the sides of the bowl. Stir in 2/3 of the chocolate chips. Transfer to the prepared pan and spread evenly. Sprinkle the remaining chocolate chips on top. Bake 20 to 25 minutes or or until the crust forms on top and the brownie seems to slightly pull away from the sides of the pan. It is a moist brownie and a toothpick inserted into the center will come out with a bits of batter stuck to it. Depending on your oven start checking at 20 minutes (15 for convection) when using a 9X 13 pan to bake. Remove the pan from the oven and set over a cooling rack . Let the brownies cool completely in the pan. Cut into squares after cooling. 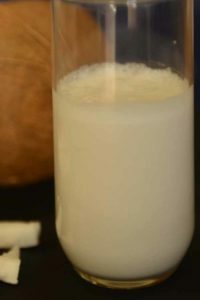 Do not skimp on vanilla - and use the best quality you have. Have you entered the raffle yet ? #CookoutWeek raffle closes in 2 days .. there is still time for you to enter the GIVEAWAY. The prize list includes Char-Broil Classic 280 2-Burner Liquid Propane Gas Grill and a Red KitchenAid Mixer… And there is more – check out my #CookoutWeek welcome post and scroll down for the prizes and the raffle entry form. Now I want that for dessert tonight.